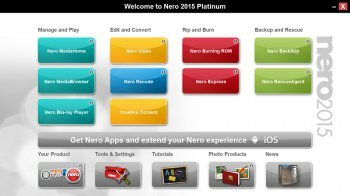 Nero Platinum burns, rips and converts all your videos and music to discs, TVs, smartphones and tablets. And with our new apps, you can master your multimedia, burn over the air and improve your Nero skills, too. It includes the full-featured Hollywood-grade 4K video editing software Nero Video with built-in video enhancement tools, font styles and motion text effects, as well as Nero MediaHome's new 'Places' feature. I've used Nero for many years, from the very start up to v7, V7 introduced bloat and instability, I tried v8 and v9 both the same as v7, but now with v10 I've decided to buy again, it's back to smooth, does not feel bulky/bloated, and runs like a dream. Thanks Nero for finding the path again. From then onwards no matter what you selected to be installed, you got ignored. One of my pet hates with Nero Burning ROM was always deselecting the media stuff because i didnt want their codecs all over my PC screwing up what i had already installed and working, but always got them anyway. So the thought of installing this bloated piece of crap fills me with the horror.